Pictured: Sylvia Grice with Jack Laugher. Freedom of the City will soon be granted to two of Ripon's finest community stalwarts - Sylvia Grice MBE, who taught Olympic diver Jack Laugher how to swim, and Hazel Barker, who was a figurehead of Ripon's Remembrance commemorations last year. Joining a small illustrious company of freemen, which includes the Prince of Wales, Mrs Grice and Mrs Barker will receive the honorary award from members of Ripon City Council, who nominated them for the decades of work they have done for the city and its residents. Hazel Barker with just some of the knitted poppies. It's estimated that Mrs Grice has taught a quarter of a million people to swim over the course of her many decades of service, and she still teaches at Ripon Grammar School. Mrs Grice has also raised thousands of pounds for charity over the years. Reacting to the news of her honour, Mrs Grice said: "I feel very overwhelmed, and very humbled. I thought it was a joke when I first heard, because I couldn't believe it. I never thought I would ever achieve anything like this, it's just amazing." Mrs Grice started teaching Jack Laugher to swim at Ripon Spa Baths when he was three years old, and is so proud of everything he has achieved. She said: "I knew he was going to be a diver because he didn't really spend any time above the water. I am so proud of him, it's so thrilling to see him doing so well." Hazel Barker, alongside Ripon councillor Stuart Martin, spearheaded Ripon's Remembrance commemorations last year, and tirelessly worked on making the Ripon Community Poppy Project the huge success it was, inspiring residents to knit more than 55,000 poppies to line the route for Remembrance. 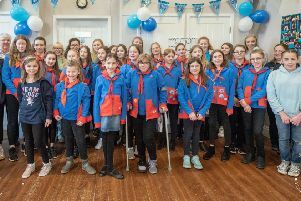 Mrs Barker is also a very well-known stalwart of girl guiding in Ripon, having devoted decades of service to the movement.